The Exorcist curse – real or rubbish? The greatest horror movie ever made is now returning as a TV series on Fox in the US and SyFy in the UK, but is there something Satanic lurking behind this gripping tale of demons, faith and a little girl’s head agonisingly turning through 360-degrees? The set for the MacNeil’s home caught fire during production after a stray pigeon found its way into a circuit box and wreaked havoc. Bizarrely, the only part of the set that was left untouched by the raging inferno was Regan MacNeil’s bedroom. Chilling. 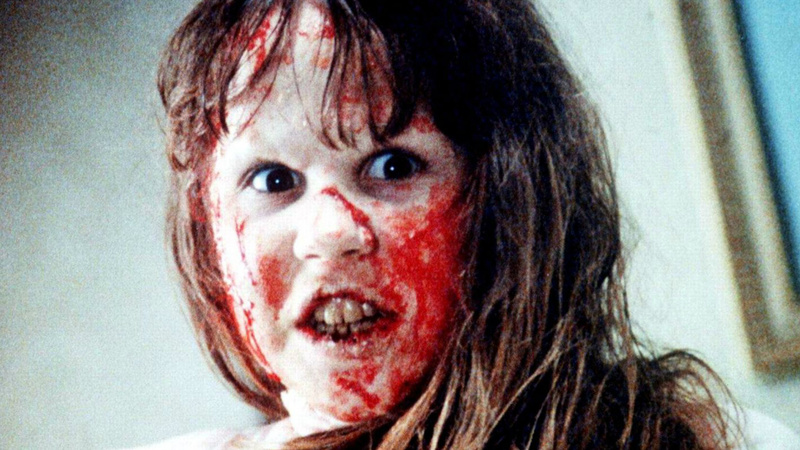 The number of fatalities connected to the 1973 film is surely the biggest slice of evidence to prove The Exorcist curse is real. Actors Jack MacGowran and Vasiliki Maliaros both died on-screen in the film, then passed away while the movie was in post-production. On the first day of shooting Linda Blair’s grandfather passed away, while Max von Sydow’s brother tragically died. Additionally, seven members of the cast and crew passing away before the film’s release from both natural and unnatural causes. Years later in 1987, Mercedes McCambridge (the voice of Pazuzu) fell victim to a horrific tragedy when her son murdered his wife and children before killing himself. At the film’s premiere, one audience member was so traumatised by the graphic imagery on show that she left walked out of the screening, tripped over, then broke her jaw. Video footage from news reports at the time also show audience members fainting, crying and generally looking traumatised by what they’d witnessed. Back in the 70s, you needed to be made of stern stuff to withstand Satan. Ellen Burstyn truly suffered for her art playing Chris MacNeil. A sequence in which a possessed Regan hurls her to the floor was done with a harness and crew member tugging her backwards. Christian evangelist Billy Graham was notorious throughout the 50s, 60s and 70s for spreading his religious views across radio and television. When The Exorcist blew up in the 70s and shattered box office records, the subject matter naturally drew Graham to the film – in fact, he actually spent time on the movie’s set. In Graham’s eyes, something had haunted the very fabric of the celluloid. “There is a power of evil in the film, in the fabric of the film itself,” he said. The Exorcist sequels largely suffered critically and commercially, but none quite so badly as the prequel to the original film. Initially conceived by Taxi Driver writer Paul Schrader, the film was shot with Stellan Skarsgård playing a young Father Merrin. Film execs hated Scharder’s cut of the film and promptly sacked him and brought onboard schlockmeister Renny Harlin to make the film again. Harlin’s effort, titled Exorcist: The Beginning, was released and branded a total sh*t sandwich. Later, producers brought Schrader back and allowed him to re-cut it and release it as Dominion: Prequel to the Exorcist. This is the sort of thing that could only happen on a movie about The Exorcist. What a colossal waste of everybody’s time.